Do you love spaghetti and meatballs.... these sweet cupcakes will give you a giggle for sure! Do you love to play pranks on April Fool's Day? My family and I love to prank each other. My family and friends have pulled some great tricks on me in past years.... I guess I am that gullible! I love "prank" food too. I enjoy thinking about what I should make here on the blog for April Fool's Day weeks in advance. 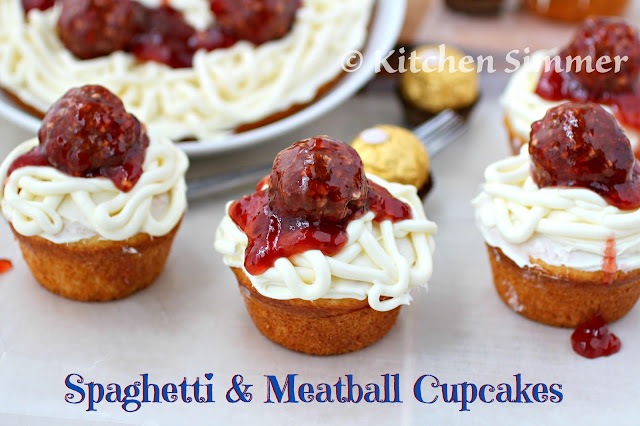 This time around I made these fun Spaghetti and Meatball Cupcakes for my kids and they went crazy for them! First of all... they love the "meatballs" that I used! Then they couldn't resist the yummy vanilla cupcakes with the vanilla frosting and strawberry jam. It's just good from top to bottom! 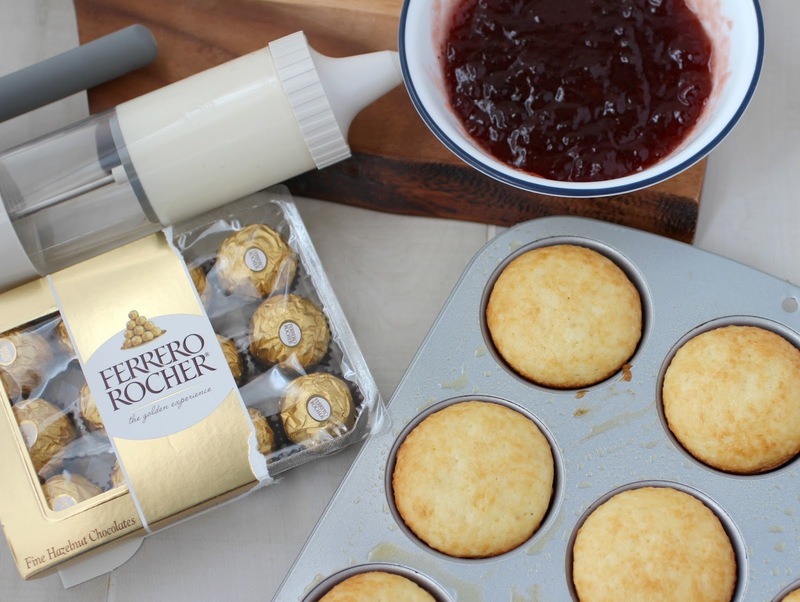 Now you can make cupcakes or a two layer 8 or 9 inch round cake instead. 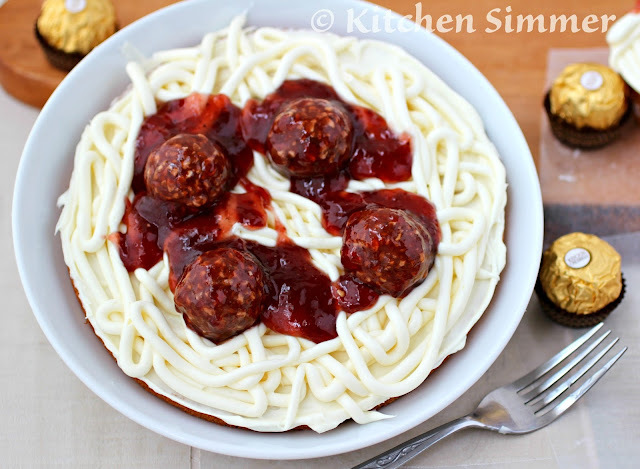 I also made a small round cake and placed it in a pasta bowl... my daughter looked at the photo and was almost convinced it was a a real bowl of pasta for a minute....not bad for Mom! So, it's not too late to make these for your April Fool's Day. 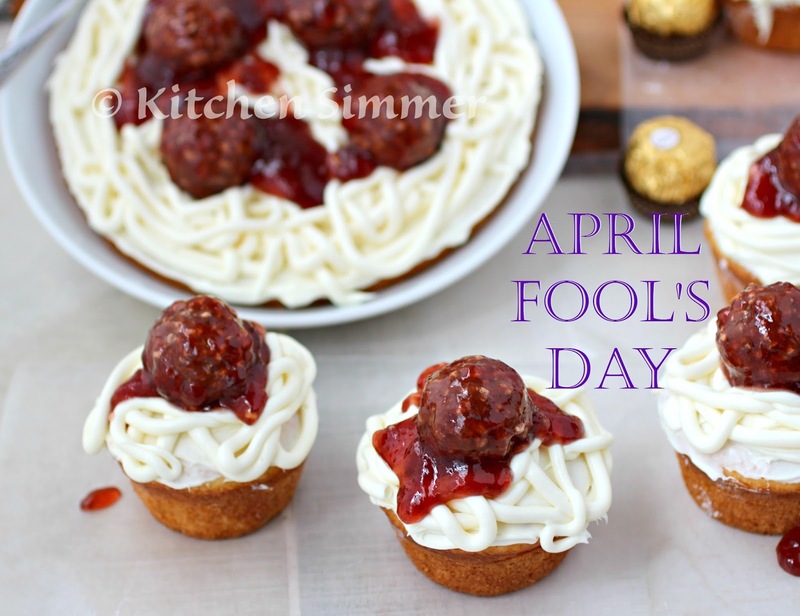 A box of cake mix, a tub of frosting, strawberry jam and box of chocolates later... you also can give you family something sweet and funny to enjoy this April Fool's Day! Step 1: Mix box cake mix according to instructions on package and bake in cupcake pan or if you prefer in two round 8 or 9 inch cake pans. Allow cakes to cool to room temperature before proceeding. Step 2: Frost cake or cupcakes with a light layer of white frosting. Step 3: Warm jam in microwave for 20 seconds until it becomes thinned out. Stir well and allow to cool down slightly. Step 4: Place Ferrero Rocher chocolates into jam and coat well. Step 5: Use a cake frosting tip that will give you "spaghetti strands" and top cake or cupcakes with the frosting "strands". 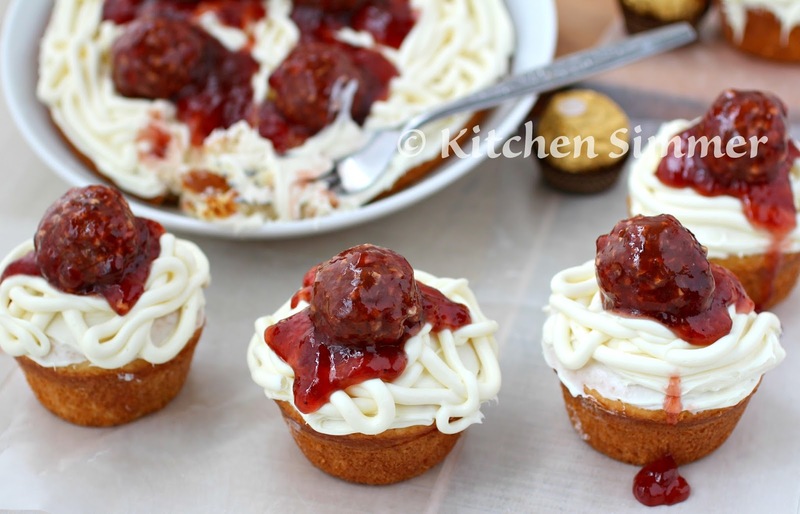 Step 6: Place "meatballs and sauce" on each cupcake or on top of 8 or 9 inch round cake. Looks like the real thing and those candies are the bomb! 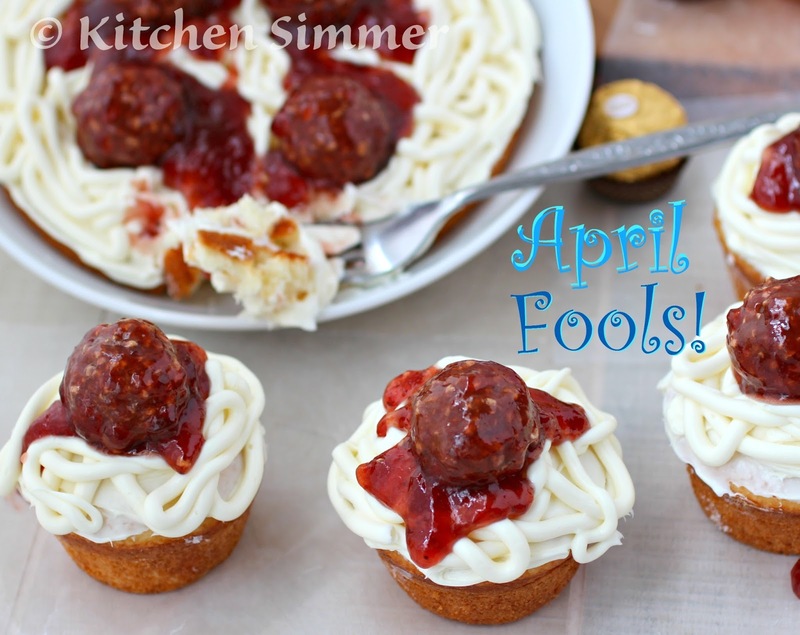 Ramona - I saw these on IG and had to come by - WOW - I'm mesmerized - this is some seriously believable "prank food" You did a fantastic job! Hahaha! How cute is that?! !